Treacherous waters (with Pirates, no less!) trying to navigate a sellout day game crowd at Dodger Stadium, with a young one in tow. Beer intake has to be moderated; shady seats need to be acquired (tough to find until the third inning or so). And I would definitely recommend leaving a little early (in our case, right after the stretch), as to avoid the traffic. But a good time was had by us. With the exception of the playground area, which was described as "okay, not that great" by my kid. To be fair, it was crowded (especially the diamond with the little steps), so we did the tall climbing structure a couple of times, and that was it. 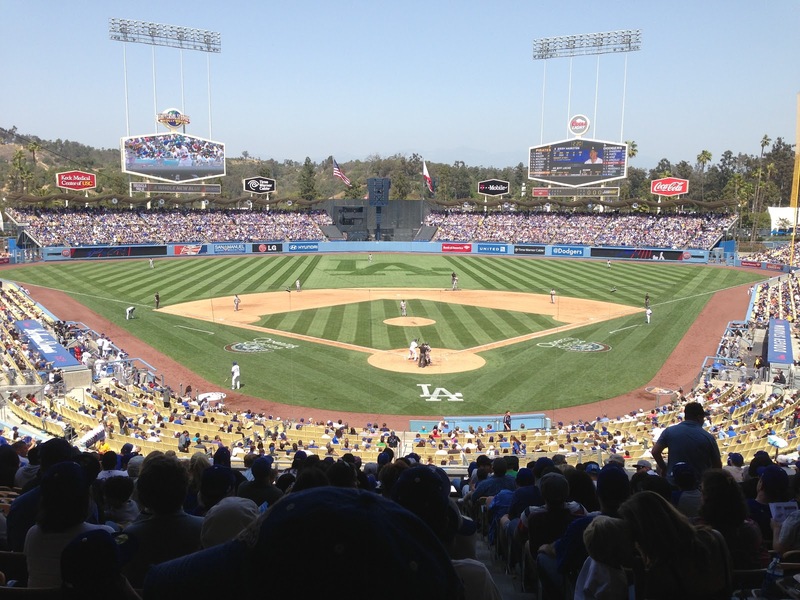 It is nice to have a place for the smaller kids to congregate, so I give the Dodgers props on that. But it's not the coke bottle slide...which has positive and negative comparisons, I agree. 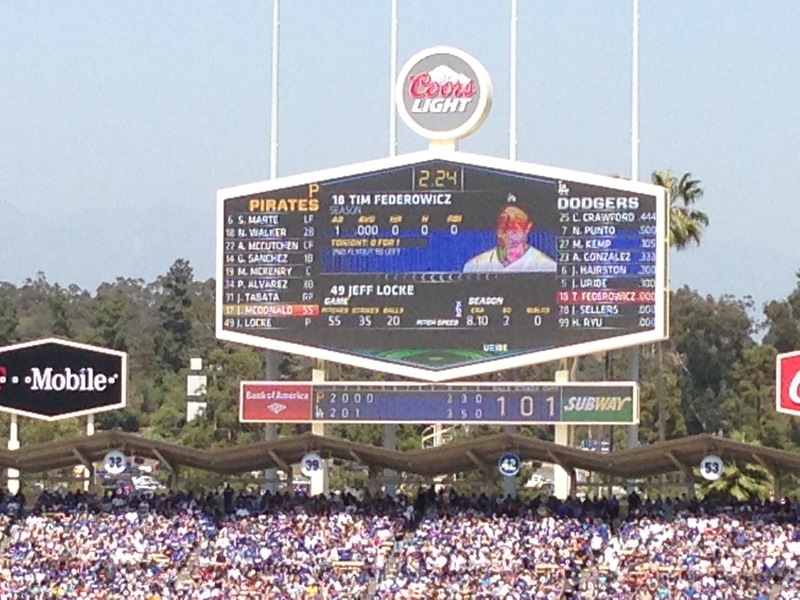 It's kind of weird not seeing a monochromatic scoreboard in right field. But it's growing on me. The view from the loge section, 103. Shady seats: the key to day games. In the bottom of the fourth, Juan Uribe grounded into a force out that killed Jerry Hairston at second for the first out. But Uribe ended up on first. 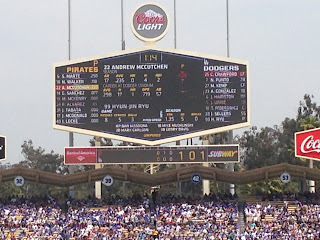 And since it was so anomalous, I took a picture of the scoreboard (note the graphic at the bottom: Uribe's name almost replicates his girth on the basepaths). 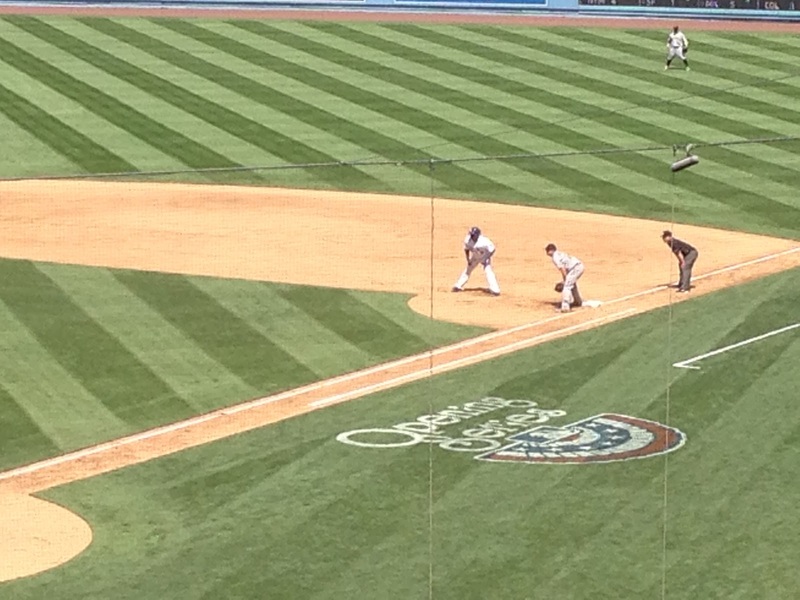 And here's proof that Uribe was actually on the basepaths. He made it to second when Tim Federowicz walked. 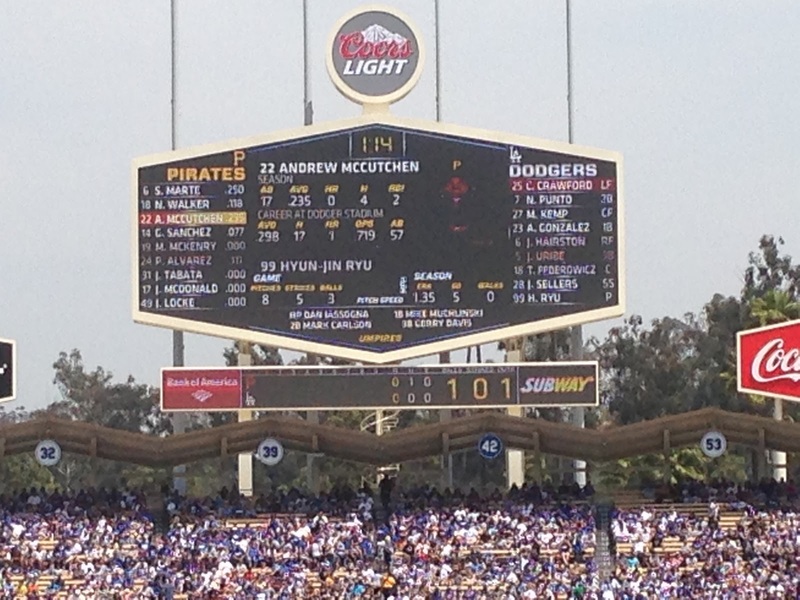 But Justin Sellers popped to short, and Hyun-Jin Ryu struck out, so he was stranded. Without anything to eat. 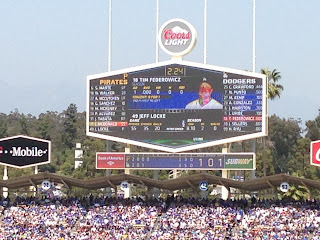 It was a great afternoon game, nice and easy (both for me, and for the Dodgers). I'm still late on posting the rest of my shots from Opening Day!